Double room (4), shower, toilet - Pension "Johannistal"
Property 73: Double room (4), shower, toilet - Pension "Johannistal"
Property 74: Double room (5), bath, WC - Pension "Johannistal"
Property 75: Double room (6), shower, toilet - Pension "Johannistal"
Single Room, Shower, Toilet - Hotel Pension "Rauschenstein"
Property 78: Single Room, Shower, Toilet - Hotel Pension "Rauschenstein"
Double Room, Shower, Toilet - Hotel Pension "Rauschenstein"
Property 80: Double Room, Shower, Toilet - Hotel Pension "Rauschenstein"
Relax in the heart of the Elbe Sandstone Mountains! Property 88: Relax in the heart of the Elbe Sandstone Mountains! Triple Room, Shower, Toilet - Hotel Pension "Rauschenstein"
Property 89: Triple Room, Shower, Toilet - Hotel Pension "Rauschenstein"
We stayed in a 1BR apartment for 6 days, touring around the beautiful Saxon Switzerland area. The apartment was clean and comfortable and we had an enjoyable stay. In addition, the hostess was very kind to us - she speaks only German, which we do not speak, but we got by via Google Translate and it worked just fine. 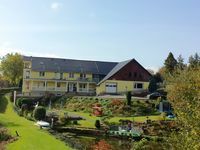 The apartment is in the hamlet of LIchtenhain which is pretty and fairly well located, although be aware that there are frequent road closures. The road to Bad Schandau was closed when we were there, necessitating a circuitous detour on side roads that was nigh impossible to find at night. And the actual road on which the apartments are was also being dug up requiring us to go round 3 blocks to reach the apartment. However, that did not detract from a very pleasant stay and we thoroughly recommend Feriendomizil.